SUNY Upstate Medical University’s decision to widely publicize the recent decision by the journal Stem Cells to retract an article from my laboratory is a vindictive and retaliatory campaign to defame my scientific credentials in the press and to my scientific colleagues. I unequivocally state that the data in all published manuscripts is valid and sound and is not falsified or fabricated. SUNY UMU unilaterally requested a retraction from Stem Cells, despite the fact that the federal Office of Research Integrity (ORI) has not yet ruled on these allegations. It is not surprising that UMU has decided to publicize this retraction in a public forum as a second attempt to force me from my tenured faculty position and circumvent decision of the employment arbitrator and the New York Supreme Court. Feuer did not operate in secret and the Upstate administration either knew or should have known he was engaging in offensive conduct. The Upstate administration delayed deciding whether Feuer’s work with his private company conflicted with his job at Upstate. Feuer constantly and actively sought guidance from Upstate administrators. The record of proof does not sufficiently establish the most serious allegations that Dr. Feuer committed theft, or that he intentionally used research facilities, personnel and funds for private gain, and without the knowledge or consent of the University. Based on written communications to him from various University administrators between the latter part of 2008 until September 2010, Dr. Feuer had a reasonable basis for his repeatedly expressed beliefs that Humurine benefited the University, that University administrators were supporting the development of his spin-off venture, that the venture would….generate significant extramural funding for his University research. Dr. Feuer’s expectation that approval of Humurine’s subcontracts would be forthcoming was not unreasonable. Dr Feuer’s activities were not hidden; rather, he was constantly and actively seeking assistance from various University administrators, all of whom had previously indicated support for the venture….the delay in addressing and finalizing, or ultimately rejecting, the Humurine subcontracts was in material respects the result of inaction by University administrators. The administration initially supported his plans, but once it determined there was a conflict, Feuer was not immediately told about it. The draconian and bungled response in confiscating and securing my laboratory in September of 2010, and the subsequent loss of over $6 million in stem cell grants to the University, resulted in loss of face for many individuals and a concerted retaliatory campaign to deflect blame and culpability away from the University administrators. SUNY UMU’s Investigation Committee designated to evaluate allegations of data fabrication, was a venue, which allowed UMU complete control of proceedings, and was designed to ensure a predetermined “guilty” outcome. UMU repeatedly ignored my complaints regarding the impartiality and integrity of the proceedings. Complaints regarding the composition of the committee, the limitations to access and the mishandling of data, inadequate qualifications of the “whistleblower” (a University accountant), failures in properly securing extensive amounts of electronic and paper data, and significant conflicts of interests by individuals involved in these proceedings were simply ignored or dismissed without explanation. Most importantly, the committee simply ignored evidence and testimony of the former Director of the SUNY UMU Flow Cytometry core facility, who was not a coauthor but oversaw the collection of flow cytometry data and independently exonerated members of my laboratory in allegations of flow cytometry data falsification. Numerous faculty and employees at SUNY UMU have been subjected to retaliation and disciplinary proceedings over the past few years. The majority of these individuals do not have the resources to enter a lengthy arbitration, while concurrently being suspended without salary, against a University that has deep pockets and seemingly unlimited resources to conduct these persecutions. The politically vindictive atmosphere that exists on the campus admittedly intimidates many current members of the UMU community from speaking out and is symptomatic of a systemic problem. In my particular case, I believe that my attempts to relocate my laboratory and over $6 million in NYSTEM stem cell contracts to another SUNY campus in June 2010 triggered a retaliatory response. 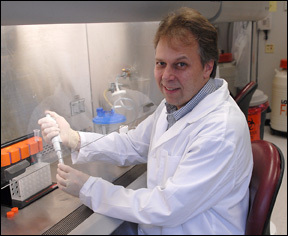 I am proud to have devoted 30 years of my life to a scientific career dedicated to fundamentally understand how human and animal viruses initiate leukemia in hematopoietic stem cells, to simulate this process in ‘humanized’ mice and ultimately develop treatments and therapies for leukemia and cancer. This intellectual curiosity and pursuit does not lend itself to using “fake” data. Although my academic career and many promising lines of research have been destroyed by the actions of SUNY UMU, I firmly stand behind the veracity of my publications, my data and the people that have worked in my laboratory, and continue the fight to vindicate myself. Thanks for posting this, Ivan. It’s really difficult for outsiders to ascertain truth in a contentious situation. Now we have heard from the other side. Well, I feel vindicated. His defense is very much as I predicted in the previous thread. I want to heard what ORI will say. It would be difficult for them to be as biased as a university committee might be. It would also be good if someone familiar with flow cytometry would look at these papers and comment. You may be aware I take no prisoners when it comes to science-fraud. Relocation and 6 million dollars may be key this sad affair, not science-fraud. In my opinion Gerold seems to be telling the truth. Why else would he make such a statement? Can anyone post links to his papers here? I am not so concerned about any one individual, but the many cancer stricken children that suffer whilst there is an apparent witch hunt against honest scientists making real science-breakthoughs! These researchers need support. They certainly have mine! You have the paper link in the RW blog post from yesterday. Dan Zabetakis: An easy to see example would be e.g. 4A and 4B, look at the red lines (Isotype control) and they are identical, which is a good example of bad science. Unless I am missing something, your comment about the use of the same isotype control flow cytometry diagrams for the studies is puzzling. If the anTibOdies are the same type (IgM etc), then a different irrelevant antibody of the Same type is precisely correCt , and the corrEct inteRpRetation of this work is inexctricablY linked to the appropriate use of the isotype. Stewart: I had another look at the 4A and 4B and they represent different time points after transduction, so I assume that you shpuld need two different isotype controls since they represent two different experiments with different times allowed for the antibodies to bind. Yes indeed – http://jvi.asm.org/content/77/22/12152.full Fig 5 A Mock lanes are a mockery of science. In the upper band (purportedly 110bp) Mock lane 1 appears to be a mockup from Mock lane 2. Several other splice lines are readily noticed in this figure. Hopefully the ORI investigation reviews this piece of work. I look forward to a retraction notice for this paper on Retraction Watch. Overzealous administrators notwithstanding, such images are indefensible as scientific evidence. I am just curious how a whistleblower specialized in accounting leads to a research misconduct investigation; instead, financial accusation seems to be minor. Is an accountant credible in science? Flow cytometry is the easiest thing in the world to fake – sometimes you can just add different amounts of antibodies to get outputs that will defy the most rigorous of forensic examinations. Aside from the reuse of the isotype control – which in isolation I would pass over as being insignificant oversight – the manipulations claimed by the committee wouldn’t leave any detectable issues in the publications. For them to conclude this they would have to have done a forensic examination of the files stored on the FC server OR had a whistleblower make accusations or possibly both. You would think you would need a whistleblower just to show the committee where the bodies were buried. Reading the committee’s report would probably clarify this. The counterclaims published here don’t seem particularly plausible to me, but anything is possible in this strange world. It’s always possible that microscope images could be switched by accident, but I also note that the stained and DAPI images don’t correspond. I think they should, shouldn’t they? I don’t do this type of experiment myself. Yes, they perhaps should have done an isotype at each time point, but, and its a big but, they may have decided to only prove the isotype did not stain at the earlier time point. Perhaps a poor decision as the target may well change affinity over time/conditions. Additionally the H&E in the Jurkatt does not match the DAPI. Agreed there are several splices in 5A. I think you may well be onto something, against my better judgement. However, I am still not entirely convinced…do you have any more examples? Sorry to bring up something completely unrelated. This is bugging me for a while. Can someone help me in looking at this Fig.3? This is maybe one of the blog entries where there is special value in staying on topic? Maybe you could have picked a better place to air this?